Five years ago this week, I asked myself a question—What is going on in the natural world today?—and wrote down the answer in a hardbound journal specifically reserved for the project. That day, at least, I wrote mostly about the weather, feeling mildly foolish as I did so. I had no idea where I was going, and it didn’t matter: I was sure that the world around me would show me the way. All I had to do each day was open my eyes, expand my senses, and write and draw my way to the answer—and keep on doing it. Whatever else happened was out of my hands. Fast forward to the present. I’m halfway through volume nine, and still going strong. The space where I keep old journals expands like a rift basin, pushing my field guides further and further down the bookshelf in a bizarre biblio-version of plate tectonics. Every day, I keep asking myself that same question and seeing where it takes me. Every day, I’m surprised by the answers. My approach is simple, yet eclectic. I write on blank pages without lines, so I can change the formatting of each page to suit my subject and my mood at the time. When I go somewhere new or interesting—and let’s face it, most places are interesting if you look at them from the right angle—I draw detailed maps, sometimes from memory and sometimes using printed sources or the Internet for reference. Instead of huge blocky walls of text, I separate out observations into smaller chunks, and use images wherever I can as shorthand and as the primary focus of a page. 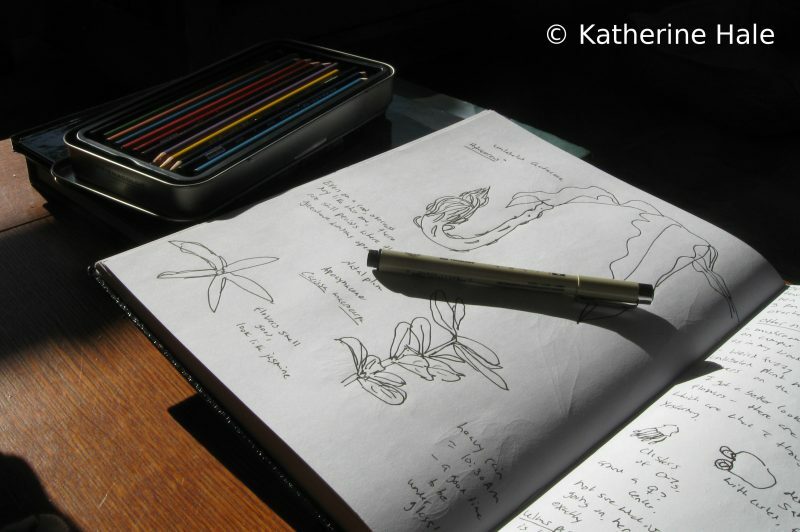 I sketch from life when I can, digital photos, field guides and museum specimens when I can’t. I copy factoids from books that seem relevant or anecdotal accounts that people report to me, citing my sources so I can find them again if I need to. I continue to detail the weather at the beginning of every day’s entry, but after that, all bets are off. There’s no telling where life will take me next. Since I began this practice, my life has changed numerous times, for better and for worse, in ways both large and small. I moved across the country four times, and took numerous shorter trips across the North American continent and beyond. I held a variety of jobs, from farm apprentice to teaching assistant to hospitality help. I switched from pencil to an acid-free art pen, with forays into colored pencils when I’m particularly inspired. My handwriting mutated from illegible scrawl to neater scripts, with occasional wobbles depending on my mood and level of distraction. Sometimes I’m sitting at a desk with electric lights, with all of the tools of modern civilization at my disposal. Other times, I’m out in the field on my knees, with my back against a tree, or curled up in my sleeping back sketching by the sharp beam of my headlamp. Despite the changes, through all the ups and downs, my journal has been my constant companion, especially at the end of the day when it’s time to recount the day’s adventures. It’s the record of where I’ve gone and what I saw when I was there, from the rocky tide pools of northern California to the Green Mountains of Vermont, from the rolling clay foothills of the North American Piedmont to the Inland Sea of Japan. The journal remembers what I tell it even when I’ve forgotten everything myself, and faithfully recounts my words back at me years later, stirring up long-dormant memories. The journal never yawns at my anecdotes or gets bored by the endless of stream of details; every day, it remains receptive and open, urging me silently to do the same. The worst days in the world are the evenings when I come to the page and my mind goes blank: I have been too busy, I have noticed nothing, I have come up short, with nothing to report. However successful I might have been in the outer world, whatever I might have accomplished, inwardly I know I have been a failure as a naturalist no matter what the numbers and reports and outside observers might say. The journal forces me to be clear about my priorities. If I neglect to pay attention to the life around me, coming back the journal is my reminder that course corrections must be made if I want to stay true to my values. I work hard to keep noticing, to get outside whenever I can, so I always have something to report, so I can face the blank page with an active and engaged mind and memory. The journal forces me to get creative, even when I’d rather not, to stay connected even when it would be easier to disengage. On walks, I pick up leaves, nuts, twigs, stone and shells and carry them home to examine in the relative calm of the evening with a hand lens. Cooped up indoors, I draw houseplants, vegetables, flower arrangements, pets, and sprouting seedlings on the windowsill. I comb through field guides and document infrastructure and land use patterns, where human ingenuity meets the natural world. Even on my sickest days, confined to my bed, I still make the effort to look at the window, describe the weather, and sketch the view outside. I don’t know where I’ll be five years from now, or what my life will look like. I don’t know what I will see or experience during that time. The future is inherently unpredictable, and I know from experience that even a seemingly smooth course can change on a dime. But after five years of continually asking the same questions, noticing and recording the answers has become a habit I’m unlikely to shake. I feel confident of this much, at least—that no matter what happens, I will keep exploring the natural world day by day, journal in hand as I go.